Tested with iOS 8 & 64-bit processor. 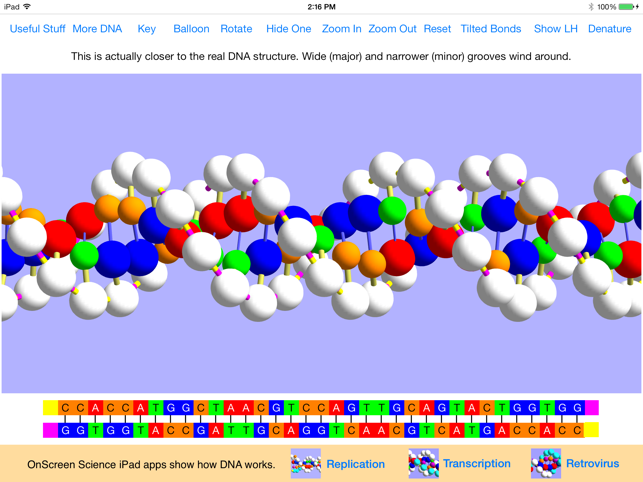 This is an interactive, color-coded, 3D model with animations and background material for thoroughly (and enjoyably) learning the essential details of DNA's structure and chemical components. Scientifically accurate. 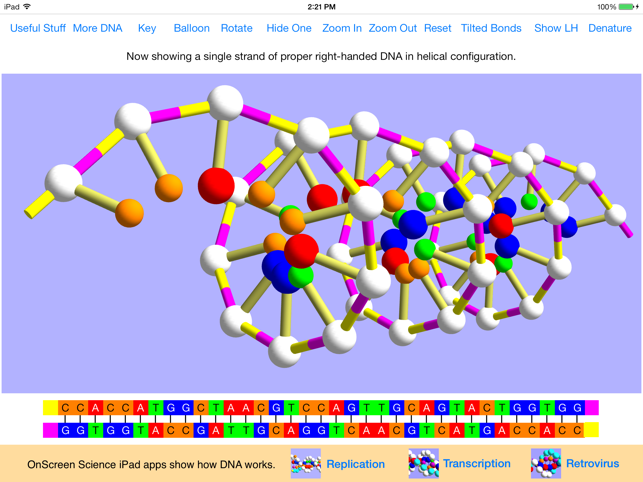 How well can you visualize the 3D structure of the DNA molecule? Can you spot erroneous depictions of DNA as a left-handed double helix? 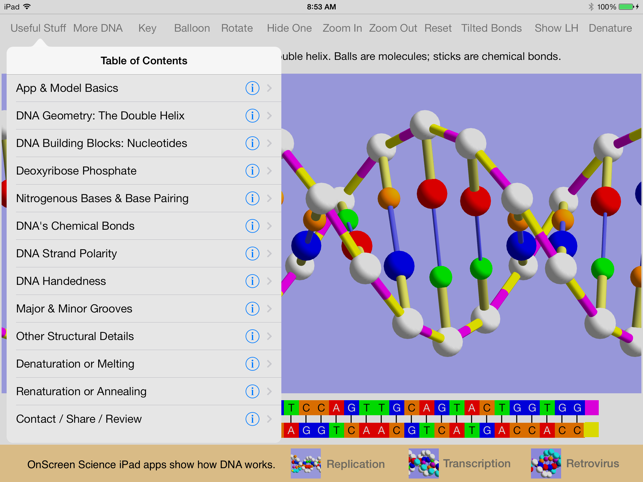 If you're not satisfied with your level of understanding of DNA structure or would like to have at your fingertips an instant memory refresher for which nucleotides pair with each other in the double helix of DNA etc., then OnScreen DNA Model™ for iPad could be worth many times its small price to you. 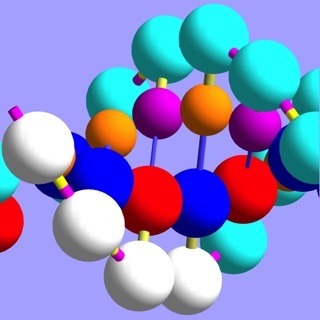 Whether you’re a student or teacher at any level or a person of any age who wants to get an intuitive feel for one of science’s greatest discoveries, OnScreen DNA Model can make the learning of DNA’s structure enjoyable and easy. And it will continue to serve as a reference for other reading and study you may undertake. 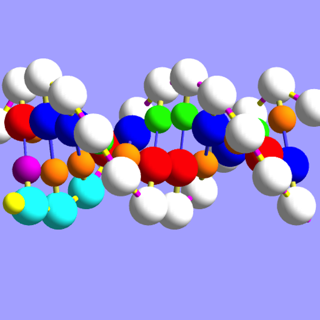 OnScreen DNA Model, designed for landscape (widescreen) orientation, provides you with a beautiful DNA model in 3D perspective to play with and to learn the basics of DNA structure from. To achieve basic scientific literacy in this age of biotechnology one needs to know what DNA’s famous double helix structure looks like in three dimensions and what its constituent parts are, because the key to how DNA works in living organisms is its structure. 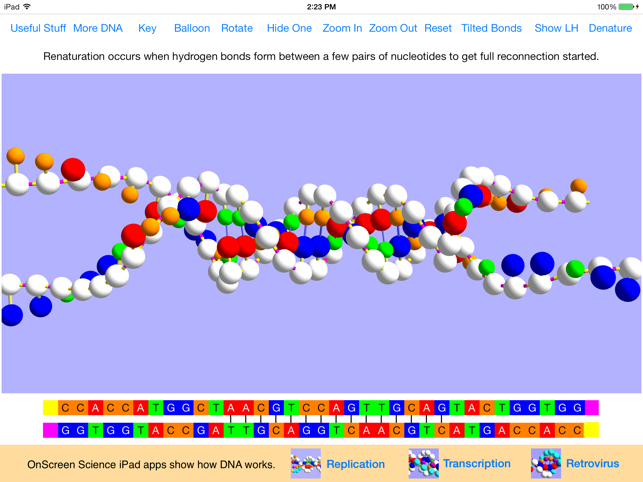 Background material on DNA (and its molecules and chemical bonds) is readily available in a "Useful Stuff" popover view (literally at your fingertips). This includes details that are often skipped over or inadequately explained, such as the major and minor grooves, plus indications for how to see the details in the model. While the screen shots will give you some idea of what it’s like, the pleasure of having the model rotate on the screen as the result of your finger’s moving touch can’t be conveyed in a picture. 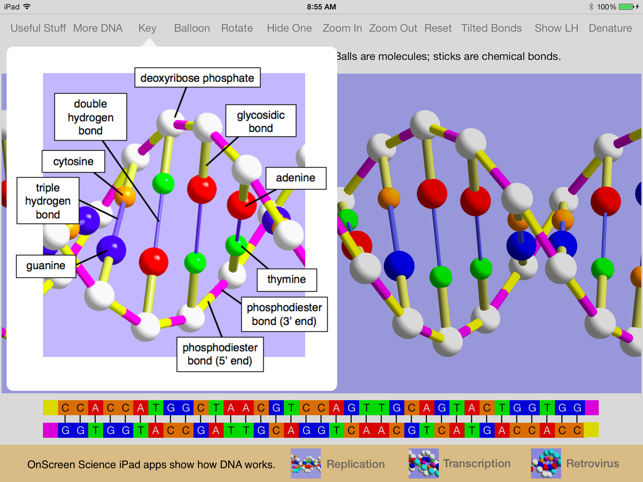 We feel the iPad is the perfect medium for OnScreen DNA Model. Care has been taken to give the model the correct handedness (right, not left, as in so many erroneous depictions), base pairs per turn, and a visual representation of DNA strand polarity. If you don't know exactly what handedness is, you will get a feel for it by being able to compare a right-handed model with a left-handed one (always labeled imaginary). The app also offers a couple of simulations that show laboratory phenomena—denaturation and renaturation—important in biotechnology. 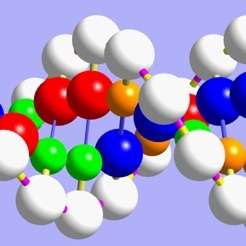 You can see the two DNA strands completely separate under simulated heating that breaks the chemical bonds (visually speaking) which normally keep them together in their intertwined helices. Then the strands can recombine in a satisfying display of bonds reforming and strands rewinding. We may be biased, but even after many months of working on OnScreen DNA Model, we still think it’s fun to play with and still enjoy looking at this beautiful natural geometrical form rotating on our screen. We hope you will too. Comments and questions are welcome at apinfo@onscreen-sci.com. Eliminated a potential annoyance in low memory condition. This app should be free. 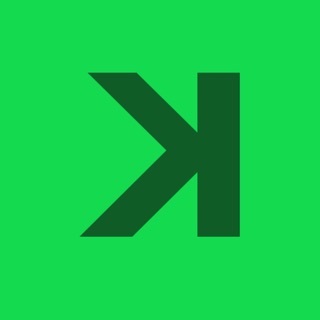 There are apps that give lot more functionality for free. All this app does is show a single short sequence of DNA which can not be edited. There are useless extra buttons for zoom and rotate which are already handled via gestures. There is a denature / renature sequence of limited relevance. There is no animation for example of replication or synthesis of mRNA and so on that would be helpful to the understanding. As a teaser for a full blown PC/Mac app it should be free and then is not likely to entice anyone to want to consider the full app. I am still using the original version and love it. This is the best animated description of the DNA model that I have seen and I have a medical background. I was so impressed that I also purchased the replication APP as well. Very well conceived and developed.